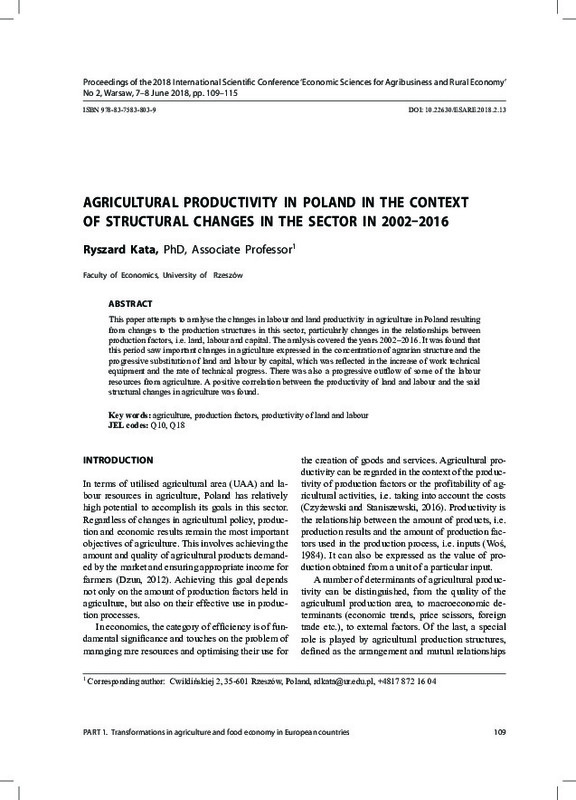 This paper attempts to analyse the changes in labour and land productivity in agriculture in Poland resulting from changes to the production structures in this sector, particularly changes in the relationships between production factors, i.e. land, labour and capital. The analysis covered the years 2002–2016. It was found that this period saw important changes in agriculture expressed in the concentration of agrarian structure and the progressive substitution of land and labour by capital, which was reflected in the increase of work technical equipment and the rate of technical progress. There was also a progressive outflow of some of the labour resources from agriculture. A positive correlation between the productivity of land and labour and the said structural changes in agriculture was found.